I've been a "Featured Publisher" with FoodBuzz (now DailyBuzz Food) since December 2007. One of the perks of this relationship is occasional offers to try products, sample menu items, and review cookbooks. I usually decline such offers (unless it's for a cookbook, as I'll always say YES to free books), but when asked if I'd try some of Panera's new soups I gladly agreed (I do like Panera, which started out as the St. Louis Bread Company, though I don't eat there often). So, as part of the DailyBuzz Food Tastemaker program, I received a gift card and stipend from Panera to do so. All opinions, however, are my own. Panera's soup menu changes every day. There are five varieties offered daily, with two additional seasonal selections that switch each day. I chose the creamy tomato soup paired with a "Big Kid Grilled Cheese" (three cheese with bacon). I just couldn't pass up my favorite classic soup & sandwich combination. 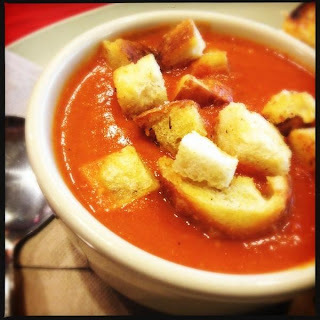 According to the Panera Soup Stories webpage, they use whole pear tomatoes in this soup for a more intense flavor, less bitterness, and a nice texture that's not just a smooth puree. The soup is topped with asiago croutons, which are meant to mimic the flavors & textures of a grilled cheese. I was happy with my choices; the soup is boldly flavored (instead of tasting like watery tomato juice, a curse of many tomato soups) with a generous topping of croutons. It made for a satisfying & comforting dinner on a cold November evening.